Excellent. Politician art again! But isn’t all art is political, though? As is pretty much everything, in fact. Even animals have their own hierarchy system, intrinsically political in nature. We can’t avoid it, particularly us human beans, struggling to cling to the vine. We need structure. For society to function we need be told what to and what not to do, often to unbelievable extremes. Unfortunately, as is regularly the case, the top of our self-imposed hierarchy mistreat and manipulate us and we in turn mirror their behaviour in our microcosmic lives, sometimes abusing others around us and even the planet on which we live. Damien Ortega’s work often deals with political issues concerning his native Mexico, but the themes he tackles in his new exhibition, Traces of Gravity, run through society and mankind as a whole and he explores them alongside and through, traditional human emotive characteristics. 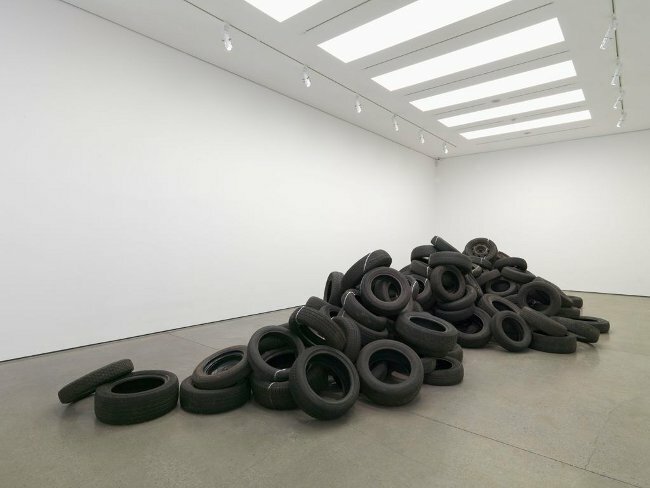 Set in the ground floor gallery of the White Cube, Mason’s Yard, Congo River consists of a number of carefully placed (but seemingly chaotic) car tyres, spread around the floor and built up in piles. What appears to be white powder can be seen in places, but it’s nature is not immediately obvious. It is in fact salt, and has been spread along the tops of the tyres in a straight line. The salt indicates the snaking stretch of a river and, depicted as a line of white powder, could be addressing the topic of cocaine smuggling. It is interesting that the line of salt can only be seen as a dead straight line from two viewpoints – at either end. At any other point the line is broken into many as it crosses various levels of the tyre, possibly a comment on the continued damage to great rivers through industrialisation. 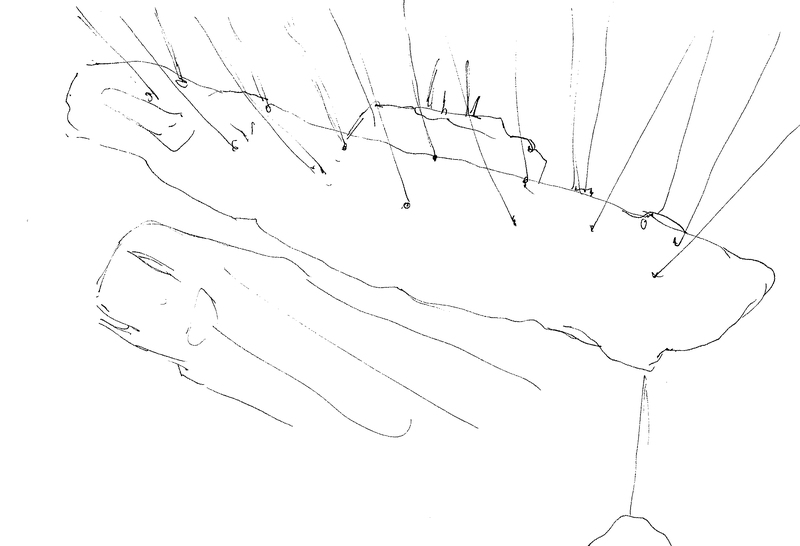 The same broken/unbroken illusion is created by the placement of the tyres whereby they appear as carefully peaked mountains from each end, but a chaotic sprawl in the round. Although the physical set-up can clearly be a visual metaphor for a river running through landscape, other elements complement the intended notion. It spoke to me of disruption. The choice of materials; salt and rubber – natural elements refined by humans. The contrasting natures; chaos and order – line/broken line – our human chaos disrupting the order of nature. It’s also notable that all of the works in this exhibition are monochrome, or variations of black and white, invoking the traditional connotations of white as pure, black as impure – white representing nature, while black is humanity and industry. Contrast and juxtaposition emphasising the vast gulf of difference. In an empty darkened room on the lower ground floor hung what looked at first glance much like a whale or shark, suspended on hooks and bleeding white matter. Moving closer I realised that no, indeed, I had not mistaken this for a Damien Hirst exhibition, the suspended being was in fact Hollow/Stuffed:market law, a representation of a submarine made from industrial sacks. Salt is used again, flowing from a small hole at the underside of the front end; a reference to the use of narco-submarines in cocaine smuggling along the South American coast to Mexico. The lighting in the room is dramatic, with a quite literal and perhaps also metaphorical, highlight on the work and the issues it confronts. The steady stream of salt, piling up like the sands of an hourglass, seem to be pinpointing ongoing wastage; not in Mexico alone but as part of our global throwaway culture. Embodying the principle of interactive, living art, the installation is constantly changing. I wondered what it might look like when the salt runs out. When the belly of the beast, so to speak, is empty. Will it just hang there as a few empty sacks, signifying our failure and as an unsettling portent for the future? ‘Preserved’, in the final room, continues to use salt as a primary material. 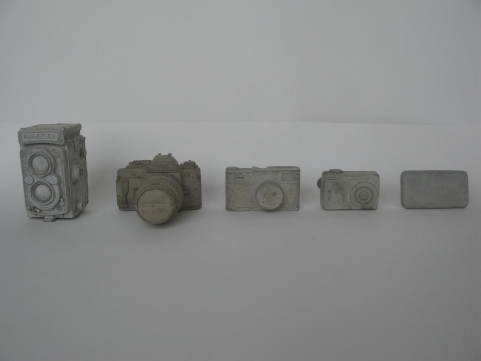 Creating a negative image, the salt gives the spatial void around the vehicle solid form, a technique also employed for the adjacent ‘Fossilised’, concrete casts capturing the space inside old cameras. Rachel Whiteread’s House, ’93 strikes me as a precedent; the exploration of unused and unnoticed space and its transformation from void to form ties in with Ortega’s preoccupation with change and adaptation. For ‘Preserved’ Ortega utilises alternated lighting, striking the installation with two spotlights and enforcing varied viewpoints upon the viewer, highlighting again the disparity between changes of perspective. 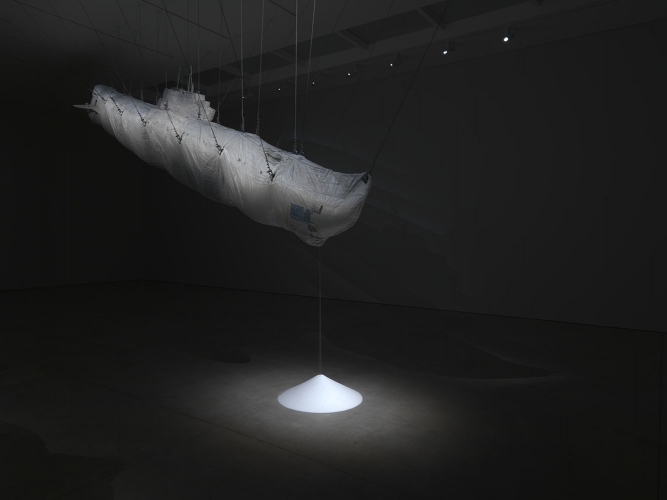 Damian Ortega’s work is both aesthetically pleasing and intellectually stimulating. Like all my favourite art it made me work for the meaning, encouraging and challenging me to decipher its threads. Much of my interpretation may not have been intended by the artist, but was generated through themes within the pieces linking and developing with my own ideas. Although seemingly an impassioned plea inviting discussion and dialogue, Ortega’s work could also be seen in an instructive form; an offer of guidance to our political leaders. Perhaps even, in its most abstract form, a morality tale through salt.